racial overtones in anti chin peng campaign – welcome! with reference to my post ‘84 years old man dangerous’ on chin peng. i used to love raja nazrin… for all his wise words but ever since after the perak fiasco, no i don’t love him anymore. i now love zaid ibrahim! i fully agree with him that umno being so adamant not to let chin peng return home has some racial undertones. here is the full article from the malaysian insider. KUALA LUMPUR, May 29 — Former communist leader Chin Peng laid down arms 20 years ago, and on April 30, he lost his final bid in the Federal Court to return to Malaysia, but in recent weeks Umno leaders and media controlled by the party have turned him once again into the country’s “Public Enemy No. 1”. Datuk Zaid Ibrahim, a former Umno Cabinet minister, expressed concern today over the racial overtones of the campaign to prevent Chin Peng from coming home. “According to Rais Yatim and Ahmad Zahid Hamidi there is a new enemy — the group that wants to revive communism. The ministers may have come to this conclusion because there are a few Chinese who want Chin Peng to be allowed home,” the former de facto law minister wrote on his blog today. Rais, the information minister, and Ahmad Zahid, the defence minister, both claimed this week there were moves to revive communism. Utusan Malaysia and Berita Harian have also been running anti-Chin Peng stories on a daily basis in what appears to be a campaign to whip up a sense of nationalism among readers. Former security forces veterans are also being interviewed to rail against the “evils of communism”. 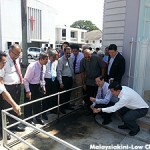 Rais also said this week that RTM would start airing documentaries on the “cruelty” of the communists. Writing in his weekly column in Berita Harian, Datuk Abdul Rahman Sulaiman, a former MP and a media advisor in the Najib administration, claimed that the principles of freedom of speech and democracy were fronts to revive communism. He added that the tendency of the opposition to speak of a class struggle by using specific terms such as "ruling elite", "Umno elite", "Umnoputras" and "marginalised groups" reflected the same pattern. Chin Peng – former leader of the Communist Party of Malaya. The anti-communist campaign so far suggests an attempt to paint a picture of the Chinese community as sympathisers. It also appears to include the portrayal of Malay Pakatan Rakyat (PR) leaders such as ousted Perak Mentri Besar Datuk Seri Nizar Jamaluddin as a communist sympathiser because of his close ties with the Chinese-dominated DAP. Zaid, who was sacked from Umno and who is expected to join a PR party, defended those who have pleaded for Chin Peng to return to Malaysia. He pointed out also that even the Chinese in China were now practising free market capitalism as are the Chinese community in Malaysia. “So what is the motive of Umno in making a big issue of communism? Don’t cause friction among the people by creating a new enemy. 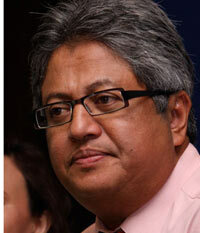 Zaid noted that Utusan Malaysia was campaigning aggressively against Chin Peng, and while he agreed that the former communist leader was “cruel,” he pointed out the “cruel” communists included former fighters such as Rashid Maidin and Shamsiah Fakeh who were allowed to return home to Malaysia. don’t forget to click on the malaysian insider to read the interesting comments… of which 90% agree with zaid!